Two pork sausages in gravy with mashed potato. 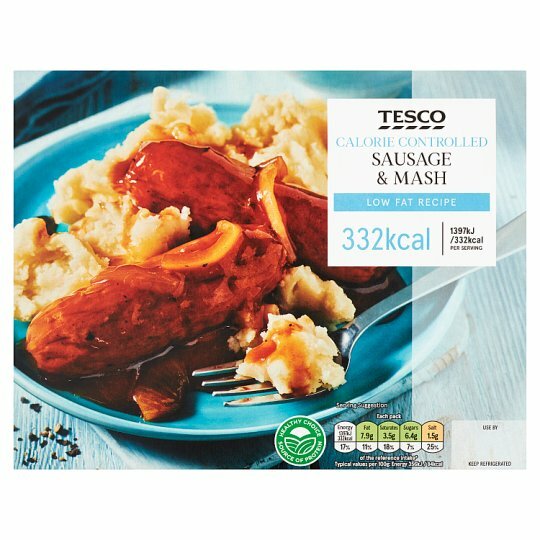 Mashed Potato, Pork Sausage (22%), Water, Onion, Cornflour, Red Wine, Chicken Extract, Tomato Purée, Glucose-Fructose Syrup, Pork Gelatine, Red Wine Vinegar, Redcurrant Juice, Vegetable Juices (Carrot, Mushroom, Onion), Caramelised Sugar, Thyme, Sugar, Salt, Grape Must Concentrate, Acidity Regulator (Citric Acid, Sodium Citrate), White Pepper, Gelling Agent (Pectin). Mashed Potato contains: Potato, Single Cream (Milk), Salt, White Pepper. Pork Sausage contains: Pork, Wheat Flour (Wheat Flour, Calcium Carbonate, Iron, Niacin, Thiamin), Water, Rapeseed Oil, Dextrose, Salt, Black Pepper, Beef Collagen, Yeast Extract, Nutmeg, Coriander, Paprika, Mace, Chilli Powder, Disodium Diphosphate, Sodium Triphosphate, Glycerol, Sage, Cellulose, Palm Oil, Pepper Extract, Sage Extract. Instructions: Not suitable for oven heating.